Dr. Gomez's research interests focus on the development of biological applications of microfluidics ("lab-on-a-chip" device development) and capillary electrophoresis (CE) with a particular interest in molecular recognition, enzyme-mediated transformations, high-throughput derivatization and analysis, magnetic valve actuation development, fiber optics detection integration and applications, chemometrics, flow-injection analysis (FIA) and surface plasmon resonance. Since his initial faculty appointment in 1994 he has received over $13 million dollars in research funding from the NSF, NIH, DoD, Research Corporation and industry. In 1997 he was awarded a NSF CAREER Award. Dr. Gomez has published over 80 technical articles, two books and eight book chapters on his research. Since 1994, he and his students have presented over 160 scientific research papers at professional meetings and conferences. He actively teaches both undergraduate and graduate courses including general chemistry, inorganic chemistry, and lectures in bioinorganic chemistry, biochemistry and bioanalytical chemistry. Dr. Gomez sat on the board of directors and was secretary of the Society for Advancement of Chicanos and Native Americans in Science (SACNAS) from 1997-2003. In 2003 he received the Undergraduate Institution Mentor Award from SACNAS. In 1993 he received the Hispanic Engineer National Achievement Award Conference (HENAAC) Most Aspiring Scientist Award. He has served on a number of NSF, NIH, and NRC review panels. He is strongly committed to science education having served on a number of community and university educational policy and scholarship committees. 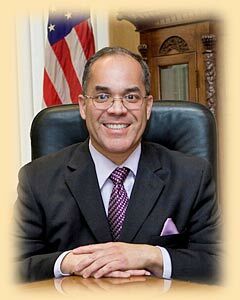 Gomez was a member of the Montebello Unified School District (MUSD) Board of Education from 1997-2001 and was named Democrat of the Year for the 58th Assembly District in 2002. In 1998 he received the Outstanding Young Educator Award from the California Jaycees. In 2007 he received the CSUPERB Biotechnology Faculty Research Award. He currently serves on the Don Bosco Technical Institute (DBTI) Board of Trustees. Gomez served on the Montebello City Council from 2009-2013 and was Mayor from 2011-2012.